Sponsor: Ewetopia is a local yarn shop in rural Viroqua, WI, carrying a beautiful selection of yarns and fibers, including their very own line of hand dyed yarns. 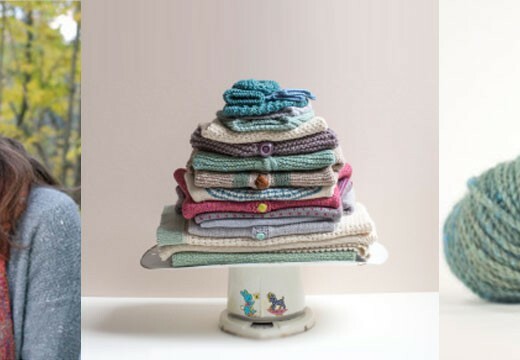 One of my favorite things about Ewetopia is it’s generational foundation, the shop was started by Kathryn Ashley-Wright and later her mother Lisa Ashley joined her as partner in the business. Along with Kathryn’s grandmother Gloria and her daughters Stella and Mae…you’ll sometimes find all four generations busy around the shop…what a special thing to have. 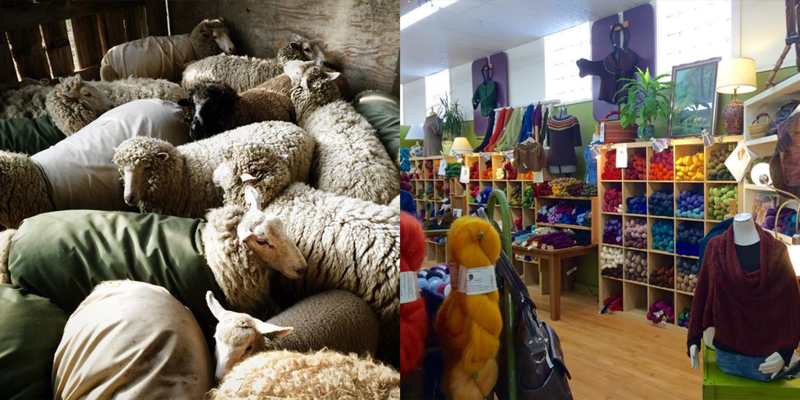 In addition to the Ewetopia shop and yarn brand, Kathryn and her family have a farm in southwestern Wisconsin where they grow certified organic hay and rotationally graze their flock of 50 ewes…comprised of Corriedale, Border Leicester and Merino crosses, which contribute to their Ewetopia yarn and fiber line. If you’re in the Viroqua area or just passing through, make sure to visit them in person. You can find a selection of Ewetopia yarns and fibers, and more info on the shop and farm online at ewetopiafibershop.com. And find them on Instagram @ewetopiayarn. Fiber folk: To me, Green Mountain Spinnery is one of the staples of the fiber industry, and has been since founded in 1981 by David Ritchie, Libby Mills, Claire Wilson and Diana Wahle. I first learned about the spinnery through my friend Annie, who is a huge advocate of their yarns. Then all of the sudden I kept hearing about the everywhere…that’s how it goes yeah? haha. The more I learned, the more I loved. From their humble hardworking beginnings, to creating an organic yarn, their formation of a coop and their overall beautiful influence within this fiber community…I’ve met few others in this industry with such a rich history and gratitude for what wool has brought them. 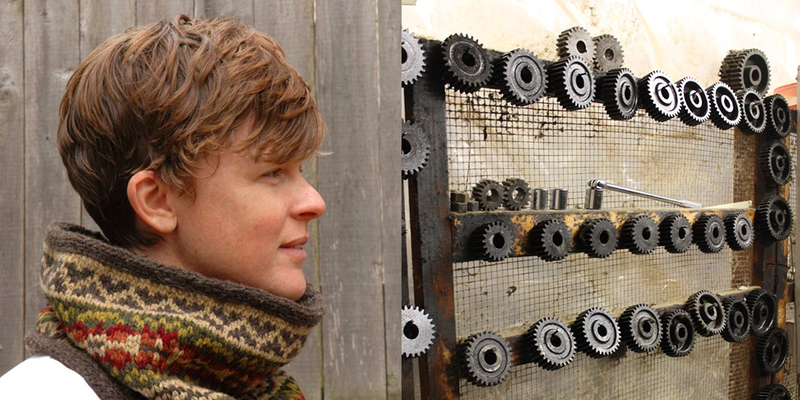 Today you get to hear a bit of that history and hear that richness in their stories, as David, Libby, Claire and Kate tell the Green Mountain Spinnery story. You can find Green Mountain Spinnery at spinnery.com and on Instagram @greenmtnspinnery. And if you’ve had the privilege of visiting Tolt in person, you know how truly amazing this place is. It’s evident the heart and soul Anna and her incredible team put into creating an experience that feels like home with your fiber family. What a special place to have in this fiber community of ours. Make sure to visit Tolt in Carnation and online at toltyarnandwool.com for a very special collection of fibers, notion and books. Giveaway: The winner of last week’s giveaways are, Margaret – you’ve won two skeins of Quince and Co Osprey yarn in Caspian from Cream City Yarn, and Yasmin – you’ve won Loop London’s new book, 10. Congratulations! 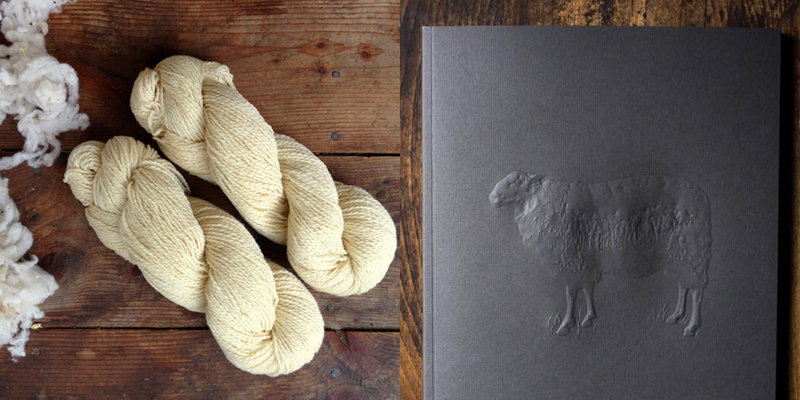 This week’s giveaway’s are sponsored by Tolt Yarn and Wool – who’s giving away a copy of their new book, Farm to Needle and Green Mountain Spinnery – who’s giving away two skeins of their Vermont Organic worsted yarn, made from Tunis/Dorset wool. To be one of the winners of this week’s giveaways, leave a comment this blog post. Oh what a wonderful giveaway! I have been stalking farm to needle since it first started previewing. 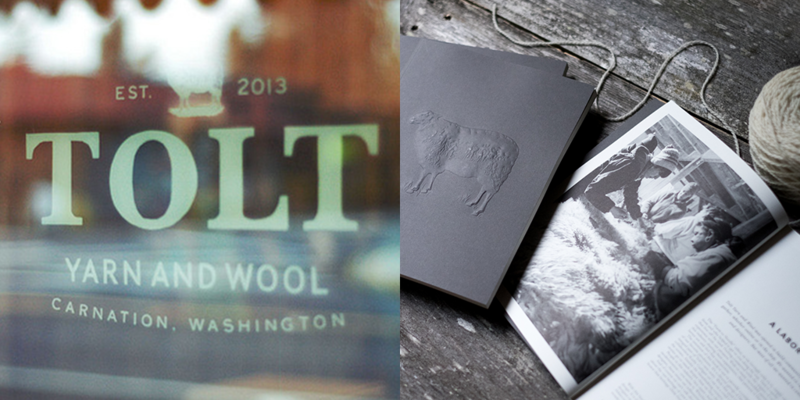 I love Tolt Yarn and Wool’s whole aesthetic and their products! as a former vermonter this was near and dear to me.the use of 100 year old machinery is very familiar and speaks of the history of fiber and craft.these folks have intentionally created their dreams and loving what you do is key to a happy and abundant life.lovely and gentle podcast ashley and your inquiries are always sincerely met.still recyling old seaters for wool as my sustainable way of.keeping the wool alive.thank you again for a very indepth interview. 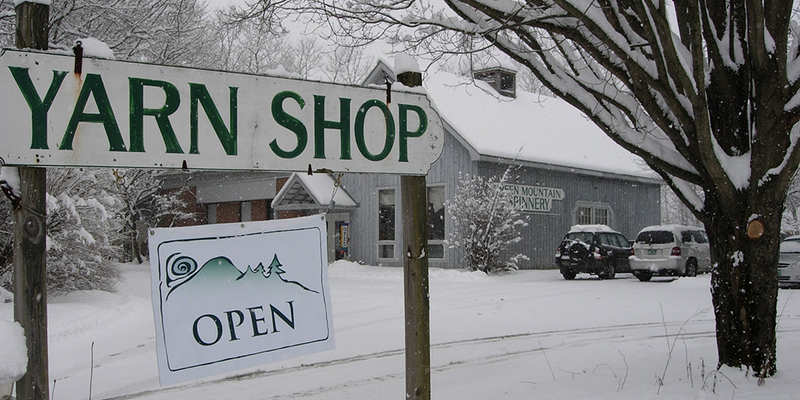 I will be visiting Green Mountain Spinnery on my next trip through Vermont! Thank you for this story. 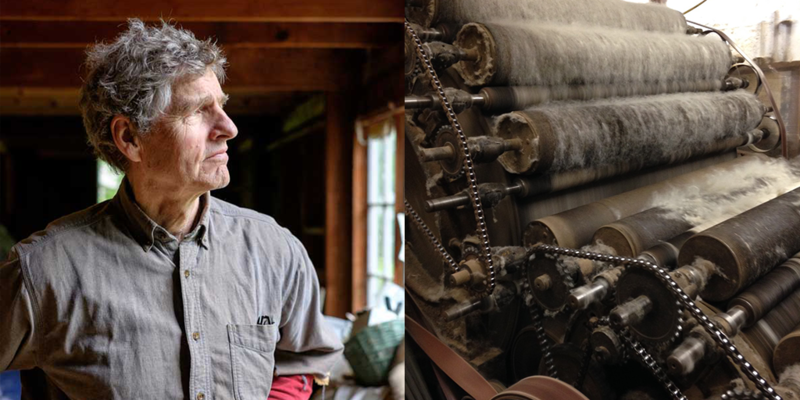 I worked with Green Mountain Spinnery yarn years ago — fascinating to learn the story behind the yarn all these years later. Will have to put that garment back into circulation now! 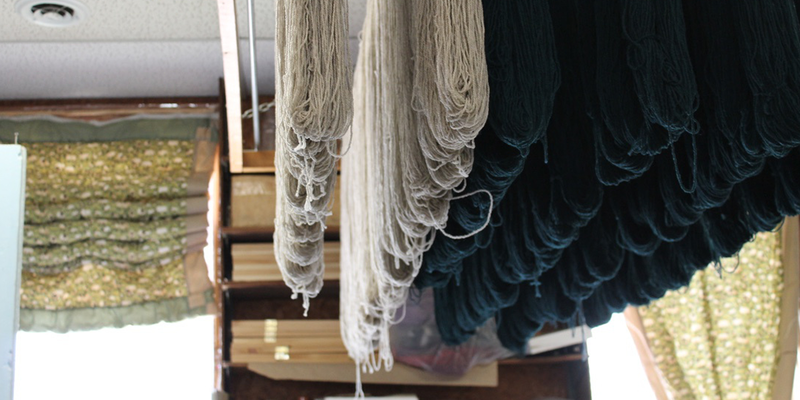 It’s been truly amazing to hear the wool story that has started so many decades ago! the use of old machinery and complete organic production is quite fascinating. So wonderful! Thanks for doing what you do! It’s so great to see what the story behind this family! 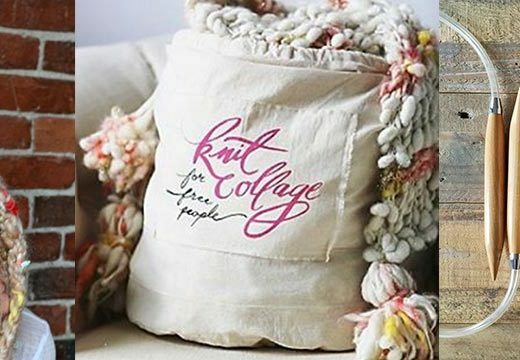 Such a beautiful book – and yarn too of course! I have loved Green Mountain Spinnery from day one. The book looks lovely. Thanks for your podcasts and great information, as well as a chance at the giveaway. Two of my favorites! I used Green Mountain Spinnery for a cowl I knit last year and it is by far my favorite cowl to wear. I missed visiting Green Mountain Spinnery on a trip to VT last month. Next time there I will definitely take a tour! Thanks for this wonderful episode. It’s great to learn some of the history of Green Mountain Spinnery. Thanks for another great episode! This one was unique and fascinating. So grateful for these podcasts; having the opportunity to win something is a bonus! I loved getting to hear the history of Green Mountain Spinnery! Now I am wishing I had bought their yarn at SAFF…. Yet another podcast that I can’t wait to listen to! I have been a fan of Green Mt. Spinnery since before I was even aware of local and small mill yarns. Awesome! I love Green Mountain Spinnery! It was so great to hear more about how they came to be! What a wonderful way to spend the afternoon – knitting by the woodstove and listening to a great story about a small successful American company. Thanks for sharing. I loved this week’s podcast! We are moving to NH in 2017 and will definitely be stopping by the Spinnery! 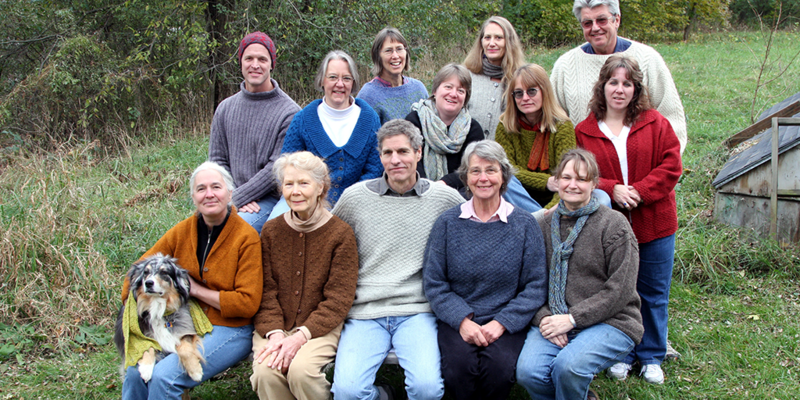 Love that photo of the Green Mountain team in their woolens! Would love to win Tolt’s awesome new book and some GMS yarn!! I love Green Mountain Spinnery. 🙂 Thanks for the chance to win! Great podcast! Just purchased a sweater quantity of Green Mountain Spinnery yarn at SAFF and it was wonderful to hear their story. Had a great time at the Nov, Workshop with the spinnery people. I love their yarn. Great to hear Green Mountain Spinnery’s story. I love their yarn. I just bought a sweaters worth at Rhinebeck this year. One day I will get to Tolt Yarn and Wool. Thank you for another wonderful podcast. P.S. your yurt looks lovely. I liked your stove. I’ve been dreaming of Tolt book and i’d love to discover the wool as well. For a non native speaker, this podcast required an intense attention, the phone line making it a bit difficult! Another great episode, thank you Ashley! 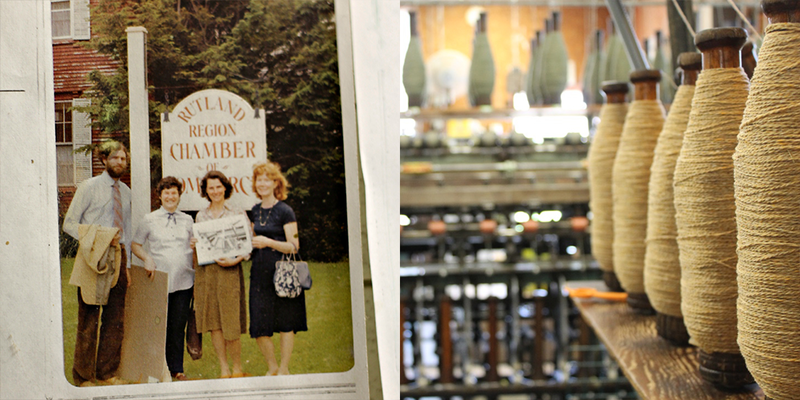 Wonderful to hear about passion for yarn that goes back decades and is still going strong. 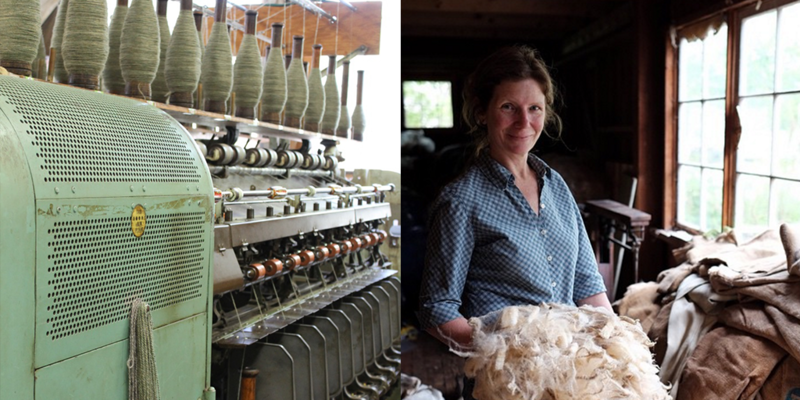 Green Mountain Spinnery is a testament to the endurance of love of fiber. I just discovered wool felting and this podcast! I am so excited! Thank you! Very interesting podcast — nice to hear the history of an established company that has been around for over 30 years. Thanks again for a great podcast. And thanks for the prize too! I loved hearing the background of a company I’ve heard admired on many podcasts. I really appreciate the depth of information in this podcast. I love the contrast with the other podcasts I listen. to. I love being able to learn about such amazing companies and people. Thank you! Thank you so much for giving ever aspect of the fibre world a forum to voice their amazing stories. In such a complicated world, it is beautiful to just slow down and listen to your very thoughtful guest talk about their very “slow” process. You are a saint to celebrate theses heros from farm to needle. Another inspiring episode – thanks! I’m so lucky to have Tolt within driving distance of my home (Seattle)–a great shop and community. And another great episode! can’t wait to listen to this episode! I just finished knitting a sweater in Verb’s Flock yarn, which was spun here. Thanks for sharing! I so look forward to these podcasts! Loved hearing the story of this beginnings of this mill! Just last week I thought that the cast with Pam Allan couldn’t be topped- and then you do this one. The richness, memories, and beauty of this crew sharing their fiber history is so thoughtful and moving- thanks for bringing these precious stories to all of our ears. Would love to read Farm to Needle as I have my own fiber animals and love giving knitted gifts to friends from my alpacas. Looking forward to getting sheep one day! I loved the episode. I’d love to go tour the mill some day. I found out about Green Mountain Spinnery when I started spinning, but now it’s more special knowing the back story. Thanks for another very interesting podcast. Wonderful to hear that a new generation of committed sheepy folk is taking over too. I love their story and the amount of research they put in before launching the business. It’s more traditional than what we often hear today and it takes all kinds! What a great episode to listen to–hearing all the laughter was really delightful. Thanks for sharing another lovely talk! I have long been a fan of Green Mountain Spinnery. I love their yarn, but, at least as important to me is the spirit behind the yarn. I still have a skein of their yarn that I bought sometime in the 80’s. It represents something wonderful to me about the yarn community that GMS has embodied and fostered for almost 35 years now. Thank you for a lovely podcast. What a fun group of people! I so enjoyed hearing the history behind Green Mountain Spinnery. worker owned yarn?! inspiring. also cute dog! I have heard the name Green Mountain Spinnery a lot but learning more about the company was truly wonderful. If my husband and I ever take another road trip through Vermont I’m going to insist that we put a stop here on the itinerary. Great show! Love Green Mountain Spinnery! I have a sweater that I made several years ago out of mountain mohair and it still looks great. An added bonus, I live close enough to drive there. Proof that it pays to follow your dream. I really appreciate hearing how the transition over to a new generation of worker/owners is met with open minds and anticipation of new ideas. With an attitude like that, this company will be around for a long, long time. I always love hearing from the old guard in the fiber community, those businesses that paved the way and kept evolving. Thank you for another great episode! Great podcast. Just caught up with all the ones downcast would download. Thanks for what you do! I’ve been hinting to my husband that I’d love a copy of Farm to Needle for Christmas — I don’t think he’s catching on! Seeing the picture of the GMS peopleHas brought me back to where I need to be, authentic to myself and what how I interact with the world. I currently live in a place that asks me when I’ll be dying my greying hair and where handcrafts and talks of sustainability are rarely heard. Your podcast is a lifeline helping me to solidify my vision of myself during a time of change. Thank you for your hard work and show casing others sincere efforts as well. so excited to her this one. Thanks again for your inspiring podcast! The very first pair of socks I ever knit was a thick pair knit, I think, from a ragg-like grey Green Mountain Spinnery yarn from a pattern in an old Knitter’s magazine issue. I still have one of those socks, rather felted, tucked away with our Christmas decorations, soon to be brought out again. I’ve loved getting to know GMS through the Tolt folk and learning more is as delicious as I had hoped it would be. I love strengthening the connections between those of us here working on aslow fashion, handmade wardrobe, renewable resource filled lives with the rich history of those that have been doing all of this as a sensible way of life for a good long time. Yeah! Just discovered this podcast!! Love it! Another great podcast as usual. Thank you for sharing these wonderful stories. Loved hearing these folks smile and laugh recollecting their beginnings. Awesome that they’re a co-op, something I didn’t know before. I pretty much want to ONLY work with Green Mtn Spinnery’s yarn from now on, in each of their many custom and retail incarnations. Love their story, attitude, and yarn! Love the show every time, thank you for sharing your work. Great podcast. Thanks for the chance to win. I read about the Woolful podcast two weeks ago and I am absolutely thrilled. I love listening to podcasts and audiobooks while I am knitting. For me it is THE perfect combination to learn more about the lovely fiber community and to get on with my projects. It was wonderful to listen to Pam Allen whose designs I love and the story of Green Mountain Spinnery is very interesting, too. I am looking forward to catch up with the older podcasts! !!! The giveaways on this podcast are the BEST….I’ve never tried Tunis, and it sounds interesting with the Dorset. another excellent episode. Thank you so much. Tolt is a 6 hour drive from where I live. One of these days I will make it over there!!!! Thank you for another great giveaway and another great episode! Woolful is always a bright spot in my week! I thoroughly enjoyed the podcast. It’s always so nice to hear about people living their dream. I really like Green Mountain Spinnery yarn. I love the rustic quality it has. Thanks for the giveaway. Love Green Mountain Spinnery yarns. Hope I’m lucky! Oh my, I love both of these wonderful companies! Thank you for the inspiration and valued resources. Great podcast! I love anything that involves wool and Vermont!! this is such a cool story! it’s neat to hear from such an established company. I am a Washington native so I love this podcast! Origin stories never get old. Very excited to listen to this episode! Loved this podcast. So inspiring. I want to move to Vermont now and be part of this co-op! Just found you guys – am looking forwards to exploring your site!